The DP97 series has been discontinued. Please see the DP9601 series as a possible alternative or contact us for suggestions. A precision portable thermometer for metrology and other exacting laboratory applications, the DP97 is a proven instrument used world-wide as a laboratory and site standard in pharmaceutical, medical, food, environmental testing, R&D, and general industrial applications. 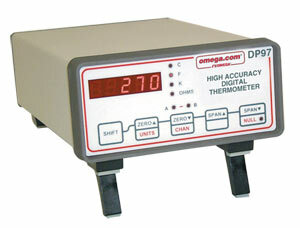 It is ideal as the reference standard for temperature calibration baths. The DP97 Thermometer utilizes highly advanced microprocessor circuit design to achieve exceptional measuring accuracy, linearization conformity and stability in a versatile but easy to use configuration. Based on a high resolution 20 Bit Analog to Digital converter, all measurement computations are performed digitally without drift. The 5 digit LED display provides a readout to 0.01°C over the entire -199.99 to +849.99°C range; alternatively °F, Kelvin or Ohms values can be displayed up to 999.99 units. Single or dual Pt100 3 or 4 wire sensors are accepted; the DP97 will automatically recognize and select 3 or 4 wire mode. Display of input A, B or A-13 (differential) can be selected; a differential “zero function” allows sensor accuracy differences to be eliminated for accurate differential readings. When used with the DP97-Probe1, the system has a temperature range of -50° to +250°C, with an accuracy of ±0.04°When used with the DP97-Probe2, the system has a temperature range of 0° to +400°C, with an accuracy of ±0.04°. An RS232 interface (remote control measure) is fitted as standard and isolation is incorporated. An analog (retransmission) output is also fitted as standard. The 0 to 1 Vdc output is programmable between lower and upper set limits.